Because you would like to recover ― by paying to yourself ― the interest that you pay banks and financial institutions for the money they lend you to finance your capital purchases: cars, college education, professional practices, home, weddings, vacations, etc. The average American family pays 34.5% of their after-tax income to banks, credit card companies and financial institutions. 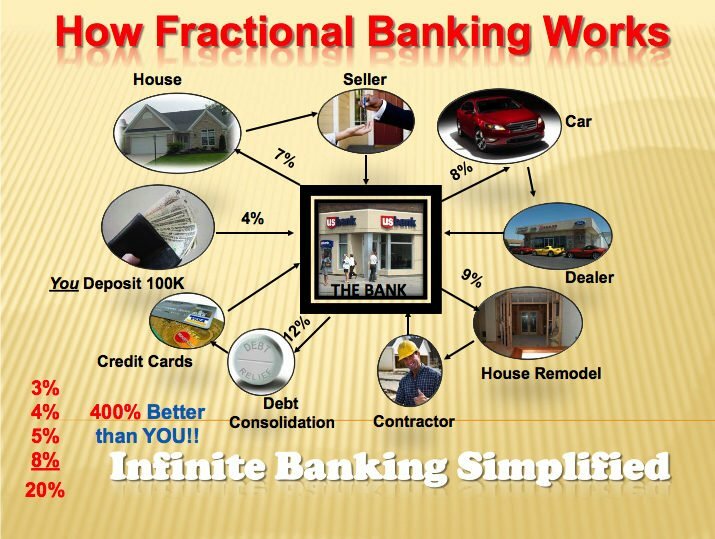 The figure “How Fractional Banking Works” illustrates how banks make money. Let’s follow the illustration step by step. Let’s assume that you deposit $100,000 at your local bank and, for illustrative purposes only, they pay you 4% interest on your deposits. Because of fractional reserve banking, this bank can now lend 9 times your deposit, or $900,000, and by creating money out of thin air, they are a major contributor to inflation. Next, an individual requests a bank loan to purchase a house. The bank approves the loan and charges 7% interest for it. The individual pays the home seller the agreed amount and the home seller deposits the amount received at that local bank. This completes the first iteration of the fractional banking process. Then, a car buyer requests a car loan. The bank approves it and charges 8% interest for it. The car dealer gets paid and it deposits the amount at the local bank. This completes the second iteration of the fractional banking process. Next, a housewife requests a loan to remodel her home. The bank approves it and charges 9% interest for it. The housewife pays the contractor the agreed amount and the contractor deposits the amount at the local bank. This completes the third iteration of the fractional banking process. Next, an individual requests from the bank a debt consolidation loan. The bank approves it and charges 12% interest for it. The individual pays his credit cards debt and the credit card companies deposit that amount at the local bank. This completes the fourth iteration of the fractional banking process. As a first approximation, the bank clears 3% on the house loan, 4% on the car loan, 5% on the house remodeling loan, and 8% on the debt consolidation loan for a total of 20%. Meanwhile, the bank is paying you 4% on your deposits. Simple math shows that in only four iterations of the fractional banking process the bank is doing 400% better than you! Wouldn’t you like to get out of the fractional reserve banking ― and the inflation they generate by creating money out of thin air ― by paying yourself the interest that you now pay banks? Now you can create your private banking through the Infinite Banking process. If you would like to learn how you can grow a substantial amount of cash that you have access to at any time without penalties, is unrelated to the stock market, and will generate income that is not included in your tax return, visit our website at http://https://infinitebankingsimplified.com/ or feel free to email us your questions at ContactUs@InfiniteBankingSimplified.com or call us toll-free at 1-844-443-8422.